I don't thinks that I will evers gets these lights untangled. Can you helps me? What Is That On Your Roof? The Animal Video Of The Day!!! Now thats it is ther Christmas season, I justs wanted you to remembers that I is available for taste-testing ther cookies. Cat Versus Potato: The Battle Begins -- The Animal Video Of The Day!!! This is Ginger. Ginger has a nemesis: a potato. Let the battle for the kitchen floor begin. The 10 Hybrid Animals Video Of The Day!!! 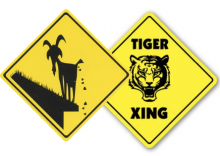 Like An Aesop Fable, Goat Goes Toe-to-Toe With Tiger! This heres light needs to go a littles to ther right. I gots it!